For faster tracking and premium features consider using our famous Drone GPS realtime live tracking platform plans. Fast tracking interval for drone / UAV / FPV gps tracking with lifetime license - no monthly or annual fees. This section is part of our Reachfar RF-V16 sms configuration topic. You can find out more about sms configuration and basic samples in our section Reachfar RF-V16 SMS basic configuration / minimal configuration. In this section you will learn how to setup your gps tracker Reachfar RF-V16 to make it sending gps data to a gps tracking platform server by GPRS. Dont forget: The default gps tracker password is usually 123456. If you have changed it recently please adjust the commands to your new device password. You need APN settings / APN data to open an internet / tcpip connection. 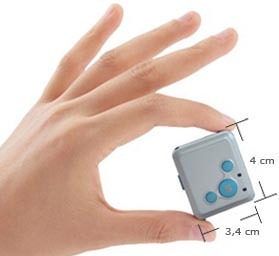 Please feel free to visit our APN section topic international APN settings for GPS trackers. In this example the serial number is located at the beginning of the answer, in this case 6401010011. Your number should differ from this example. Please note that number on a sheet of paper or notepad or something like that, you will need it later. To open a gprs connection you need to tell the tracker which network has to be connected. Find some commands with preset APN examples below. These commands also include the gps tracking platform server IP address and port. Find more APN settings at international APN settings for GPS trackers. The IP address 212.227.96.146 is a sample IP address. You will get a certain IP from your gps server platform provider at registration process. By using this sending interval you tell the tracker how often the tracker sends a position package to the gps server platform. In our freeware gps tracking plans you are allowed to use a three (3) minute data transmission interval. If you need more power we have a lot of premium plans. For drone / UAV / Quadcopter tracking we recommend our Drone GPS realtime live tracking platform plans.